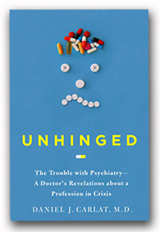 Unhinged will not be officially released until May 18, but for a preview, read my article, “Mind over Meds,” in this Sunday’s New York Times Magazine. In the article, I focus on one of the topics covered in Unhinged—namely, the abandonment of psychological mindedness by psychiatrists. When I went into psychiatry, I did so because I was fascinated by the mind. But what I encountered during training was a field that was hypnotized by the idea that psychiatry is primarily a medical, rather than a psychological specialty. Rather than understanding people, the goal of psychiatry had become diagnosing disorders, and matching disorders up with medications to treat symptoms. I had assumed I would become a psychotherapist who also prescribed medications when needed. Instead, I was trained to become a psychopharmacologist. When a patient needed therapy, I learned how to figure which therapist to refer the patient to, rather than how to actually do that therapy. I believe this is one of the central crises facing psychiatry today. If you see a psychiatrist, ask yourself whether he or she really understands you as a person. Does your psychiatrist know what makes you tick? How much have you learned about yourself, about your needs, your goals, and how to attain happiness? Some psychiatrists do, in fact, provide the entire package of medication plus psychotherapy. If you are lucky enough to have found someone like that, you are unusual, because the latest research shows that only 10% of psychiatrists offer therapy to all their patients. Instead, most of us split up the treatment, prescribing medications during 15 to 20 minute visits, and farming the therapy out to a social worker or a psychologist. It is as though we are splitting our patients into two people. One is a soup of neurotransmitters, and the other is a person. For some patients, this split treatment model works fine, but for many patients it causes fragmentation of care, and that’s not good treatment. As professionals, we can do much better than that. This entry was posted on Sunday, April 25th, 2010 at 10:32 pm	and is filed under Uncategorized. You can follow any responses to this entry through the RSS 2.0 feed. You can leave a response, or trackback from your own site. I am a 19 year old and i have anxiety disorder, my question is what kind of career could i take where so I won’t have to talk with people, cause i really get nervous wheen ppl are near, ahh got answer already on disorder anxiety. I live in Texas. I have never been to NY, but I read the Sunday Times. Your article “Mind Over Meds” coincided with my birthday, April 25. I saved it. Last week I posted a photo I took of the title and uploaded it to one of my blogs. I wrote about my wonderful psychiatrist, Dr. Wanda Henao, who finally began talking to me. I have weekly talk sessions with another wonderful woman, Olivia Ostrin. I need something different from both women. The need went beyond the 15 minute med check with Dr. H. She had no idea until I told her. I could tell by the look on her face that it surprised her. But, she was kind enough to understand, and when I need extra time to talk about anything that matters, she gives it. Those extra moments of connection are boosts. Several days ago I blogged about the extra something I get, because of your article and because of the miracle of Wanda Henao. The next day I deleted it. I was too embarrassed. Now I regret my cowardly reaction. I wish you could have read it. It was my affirmation to you. But thank you for being conscious enough to know that people need more than prescriptions. Thanks for telling your colleagues. Wake them up! It makes more sense for the hour-long (45 min.) listener to know what’s best to prescribe more than the pill pusher. I know from experience. I just might buy your book. I am a psyquiatrist in Brasil and i agree with all the Daniel Carlat’s considerations.I buyed the book Unhinged e i am writing a book named “Psyquiatry S.A.”. Daniel Carlat is cited in my book, off course. Congratulations to him.